Registration is now open for the 2019 Run with the Foxes! 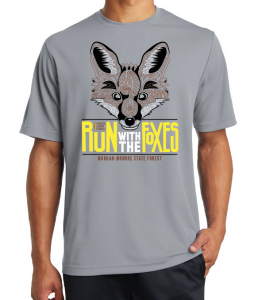 Join us on Saturday, May 18, 2019, for the 25th annual Run with the Foxes trail run/walk through the hills of central Indiana. Choose between 5K, 8-mile, 10-mile, and half-marathon (13.1 mile) courses on a natural foot trail that meanders through the mature hardwood forests of Morgan-Monroe State Forest. Read through the page below, and if you have any questions that are not covered there, please consult our FAQ’s. There is a very good chance your question is answered either on this page or in the FAQ’s! Registration is online only. The registration fee is Adult $20, Youth (18 and under) $10. There are no service fees charged for online registration. Registration closes Wednesday May 15th at midnight or when the 300 limit is met. Note: There are no refunds of race registration or t-shirt costs. Please consider this carefully before paying! Click on the Entry List link below after registration has been completed to see if payment has been made. Use the debit/credit card option on PayPal if you don’t have an account. The use of some smart phones or internet browsers may not allow payment though PayPal. This year’s shirt is the Sport-Tek® PosiCharge® RacerMesh® Tee, with another fantastic design by TERZink.com. The cost is $16. 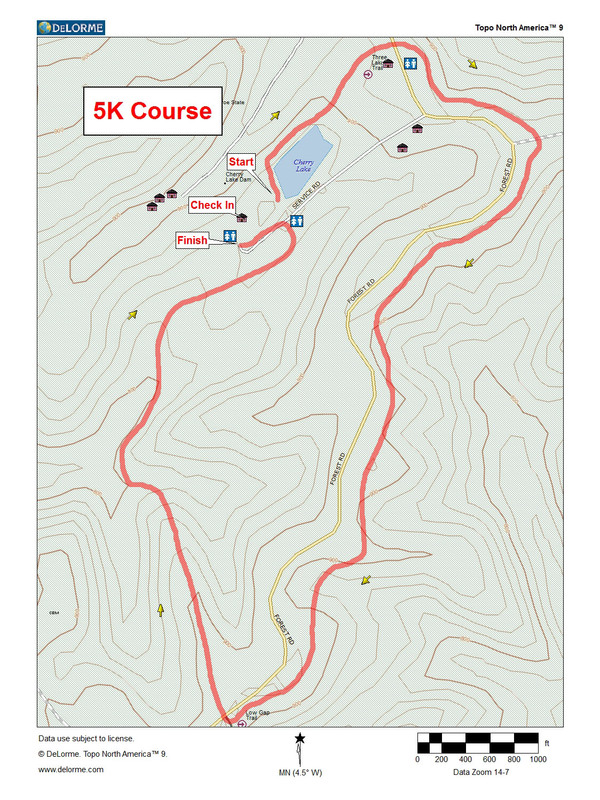 The courses follow forest trails, and have long, mostly level stretches with several steep hills, which are tempered by switchbacks. Trails are flagged at frequent intervals with brightly colored ribbon, and are cleared before the race to ensure they are mostly free of natural debris. Aid Stations along the courses offer drinks (water and Gatorade) every 2 to 3 miles. Amateur radio operators are stationed at each Aid Station and along other points in the course. Courses will use parts of the new bicycle trail that parallels the main forest road; this surface may be dirt or gravel. Check-in on the day of race begins at 7:30 a.m. (sign waiver form, pick up bib and shirt). Please arrive early to help ensure the race starts on time. The race begins at 9:00 a.m. EDT. All Runners will start on Cherry Lake dam. The 5K runners will start 5 minutes after the 8-mile, 10-mile, and half-marathon start. Click here to read important Day of Race Information. Additional parking has been created by use of the Fire Headquarters road on the north side of Cherry Lake. Note: Parking will only be allowed on one side of the service roads. See map link above for details. The Race HQ can be accessed off the Fire Headquarters road by walking down the start trail to the shelter. Traffic directors will be present to help with parking. The 8-mile course offered this year was listed previously as 13K. This change was made to prevent confusion with the 13-mile course. No dogs will be allowed on the course due to insurance policies. Cutoff time for the half-marathon is 11:30 a.m. at Aid Station #4 (9 miles into the race). Runners under 18 must run with a parent or guardian. Join us at the shelter after the race for a cold drink, fresh fruit, snacks, cookies, and other treats! Meet with the HHC volunteers who worked to make the race possible. All proceeds benefit the work of the Hoosier Hikers Council to continue building and maintaining hiking and running trails in Indiana. If you have questions or need further information, email HHC Races or call toll free at 1-855-812-HIKE. The 2019 Run with the Foxes is a USA Track & Field sanctioned event (sanction number 19-16-016). Timing will be provided by “FrontRunner Timing”. Race results will be available later in the day on this webpage. The recommended route to the starting area in Morgan-Monroe State Forest is to take the Liberty Church Road exit (Exit 134) from I-69 (formerly State Road 37) using the new interchange located just south of Martinsville. If you are driving from the north on SR37/I-69, Liberty Church Road is 28.2 miles from I‑465 in Indianapolis. If coming from the south on I-69, Liberty Church Road is 18.2 miles from State Road 46 in Bloomington. Take the Liberty Church Road exit from I-69 (Exit 134), and turn east onto Liberty Church Road. Travel approximately 0.1 miles on Liberty Church Road, and turn right onto Old Hwy 37 (first road on your right). Travel 4.1 miles on Old Hwy 37, and turn left onto Forest Road at the entrance to Morgan-Monroe State Forest. Travel 4.5 miles on Forest Road to the forest headquarters. Please refer to the parking map for instruction on parking along the designated roads or in the parking lot. The driving time from I-69 to the parking area by this route is approximately 20 minutes. All courses start on Cherry Lake dam near the Morgan-Monroe State Forest Headquarters.